Many people, when asked what they really want from life, answer "to be happy", but rarely go out of their way to do much to enhance their well-being. African Drumming, singing, meditation, exercise - these are all things that will benefit your mind, body and soul and nurture the vital sense of happiness that watching TV just doesn't reach. Drumming awakens primal feelings and the joy of this music is infectious to all around. Aside from the physical sensation of deep vibrations pulsing through one's body, the oneness with others in the group creates a glowing expression of unity. Smiles all round! There is a certain tempo in rhythmic music, about 120bpm to be precise (a brisk walking pace notated as allegro), above which the music starts to accelerate your heart rate. Hence this tempo is used in dance music of all world cultures, to excite the body and encourage listeners to dance. "127 is disco heaven." It usually works on a subconscious level, along with syncopation (offbeat rhythms) and groove, to make your feet itch to get up. This internal exercise enhances the flow of blood around the body which has myriad other positive effects on health, and is particularly beneficial for sick and elderly people who may not be able to exercise much on their own. Slower music will of course influence the heart to calm down, which is equally useful to de-stress people. We often use a mixture of fast and slow rhythms for variety. "As you play, the vibration of the drum, which is very strong, is going through your body all the time, and that has quite a dramatic effect. I mean, it's like having a unicellular massage: every cell is being massaged. It's something else!" 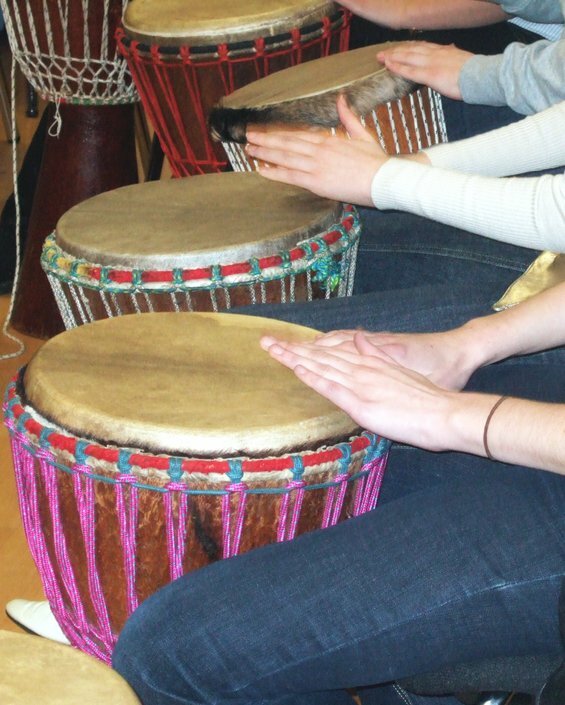 Regular drumming will build muscle strength and also help stamina and agility. A good player needs power but also swift movements that don't tire you out, so the playing can continue effortlessly. Think of it like dancing with your hands. When in Africa, it is usually very hot, and so expending any energy unnecessarily is to be avoided. So drum patterns are designed to be simple and energy-efficient to play quickly. Of course, when you really get going, you will start sweating and getting tired, but this is good and means you are pushing yourself beyond new boundaries. When many simple drum patterns mesh together they form a unified energy which is greater than the sum of the individual parts. I think it was Jim who described it by saying that when the patterns all align and sit perfectly together, the rhythm 'zogginates'. This powerfully demonstrates the need for all members of a team to pull together towards a common goal, and it's obvious when it's (not) working. Everyone's role is important for different reasons, and all are necessary to create the full picture. In a previously imbalanced team, this can be an empowering experience for people used to being the underdog, and perhaps a humbling one for management. Your hands speak through the drum. It is the voice of the soul, a direct connection to our inner being. This is made clear when trying to talk while playing: it's very difficult, as if the same parts of the brain are used to compose speech and to control drumming. Previously shy, retiring people soon feel wonderfully free once they have a drum in their hands and get used to making it speak. For many people in our reserved, English culture, just the act of making a loud noise has been discouraged for much of their life through repeated social conditioning. So having permission at last to do so can be very liberating and this freedom doesn't rub off. Once you've experienced the joy of drumming, this act of extrovert expression has knock-on effects and makes you feel more at ease in groups of people. Playing solo is very similar to public speaking: quite nerve-racking at first, but easy once you get into it. A drum circle provides an ideal safe place to learn and master these skills: failure (and the resulting laughter) is encouraged to break down fears and build confidence. It is the eyes of the children which affect me most. Seeing them at first nervous, then joyous when it clicks for them and they realise here is something they can enjoy and succeed at, is very moving. Having something to be proud of is crucial in developing self-esteem, particularly for kids who may be bullied or otherwise taunted for being somehow different, and it allows them to break free of their torment and excel. Drumming is an excellent way to develop self control. The look on a person's face, when they realise that here is something they can do well, is priceless. A machine can play music very accurately, but groove is another matter. Just as a comedian's timing is crucial, so the feel of a beat is essential: microscopic shifts of timing can make something sound just right. Practising playing dead on the beat ("in the pocket") or slightly late or ahead of the beat ("behind/in front of the pocket") will all promote better temporal awareness. Any musician will benefit from learning the difference between triplet and duplet pulses, as well as syncopation and polyrhythms not often used in classical music, but widespread in popular and non-Western musics. "...each musician ought to play drums for several years in order to be able to grasp the concepts of groove and rhythm on a purely physical level." Learning ensemble skills is a good springboard to launch/revive your musical life. Who knows where it will lead, and who you will meet...! Many of my students have gone on to play other instruments and sing with other bands. Researchers at the medical university Karolinska Institutet and Umeå University have now demonstrated a correlation between general intelligence and the ability to tap out a simple regular rhythm. Those who scored highest on intelligence tests also had least variation in the regular rhythm they tapped out in the experiment. Accuracy in timing is important to the brain processes responsible for problem solving and reasoning. Being able to listen well is one of the key skills of playing or working in any group, be it a symphony orchestra, a team of engineers discussing a building project or an executive board meeting. Drumming together helps develop the need to listen to many things at once, and not to overplay your own point of view. Like a good chairman, group facilitators will soon silence anyone who is hogging the limelight and encourage quieter players to come out of their shell. 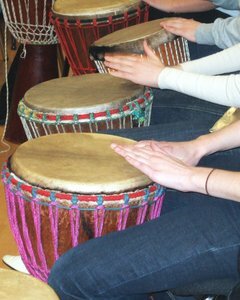 Once you've tried your hand at drumming, it will give great insight into the art of playing musical instruments in general. You will see more detail in the music you listen to, and be able to pick out different musical lines that show up with active listening. And of course, you will begin to appreciate the frightening level of ability that some virtuoso players have attained.